So, you’ve landed that meeting with an important prospect. Now what? Head on over to LinkedIn! It’s time to prepare! You want to seem as informed and relatable as possible, just like you would for an interview! But how would you do that? 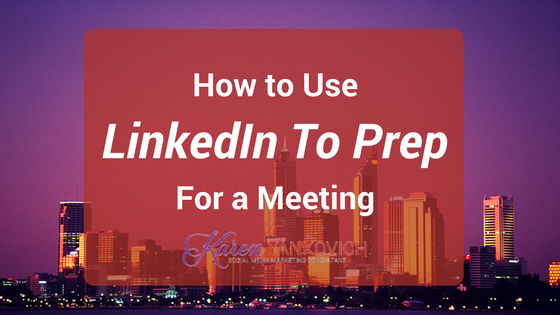 Use LinkedIn to prepare for the meeting. You have virtually everything that you need to know at your fingertips with LinkedIn, so might as well put it to good use! First, you want to read their profile thoroughly! This doesn’t mean skimming all the way through to see what places or skills you may have, but reading everything in depth. Think about the prospect, what is the purpose of the meeting? From this you can clearly define a set of business goals and use LinkedIn to fully understand what they’re after. See if you have anything in common. Maybe you share similar endorsements, worked in a similar field, took similar classes back in college; all of these small similarities can be leveraged within a meeting to make you relatable. Need to prep for a big meeting? Check this out! Next, see if you have any common connections. Maybe you both know someone you did business with in the past or were coworkers with similar people! This may help you to get to know their circle, or just be a conversation starter! Take note of these common connections! You may even have someone in common who can tell you a bit about the prospect. As I’ve preached before, recommendations are the strongest form of social proof. You get to see what real people say about them and their business. Lastly, visit their LinkedIn Company Page. LinkedIn Company Pages provide all sorts of information, great for meeting preparation. You can get a glimpse into their new hires, recent blog posts, job postings, statistics of the company, etc. All of this will give you a feel of what you may be able to bring to the table for them. Ready to start rolling? Join my LinkedUp Revolution FREE 21 day challenge to perfect your LinkedIn page! Karen – good tips. I can see using this information for other purposes beyond meetings or job hunting. It’s a good way for you to filter who is a good fit for you. Yes I do… research and prepare.. information and discovery questions!